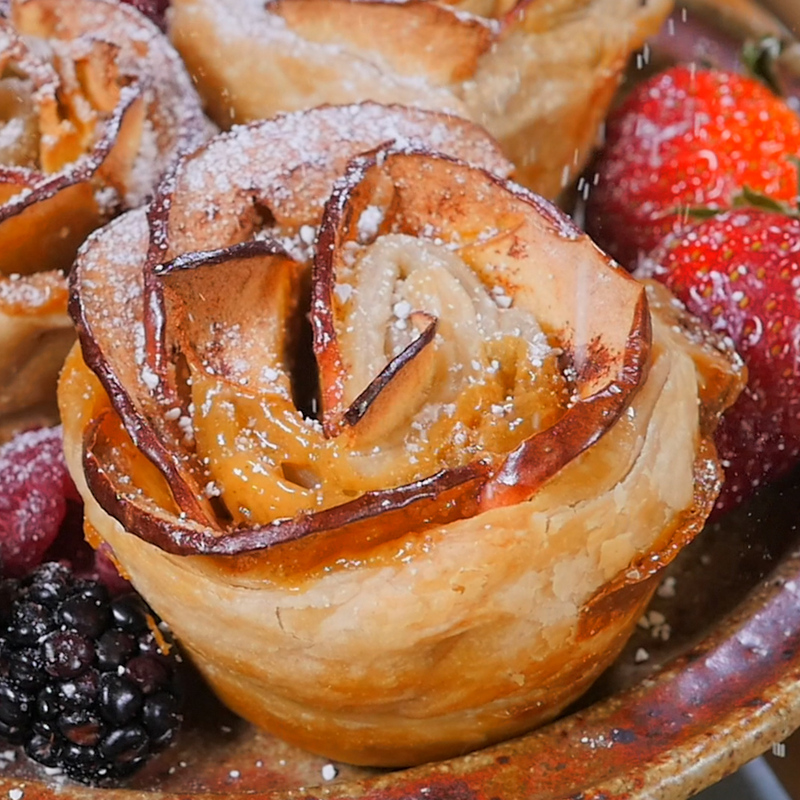 Considering How Gorgeous These Rose Pastries Look, We’d Never Guess They Were So Easy! We are all about cooking projects that don’t require an obscene amount of effort, but that turn out looking beautifully and are perfect for when we want to casually impress any guests we have over…after trying this recipe, we can confidently say: it doesn’t get any better than this! Using just a handful of ingredients, including some store-bought puff pastry, we were able to make these gorgeous pastries. 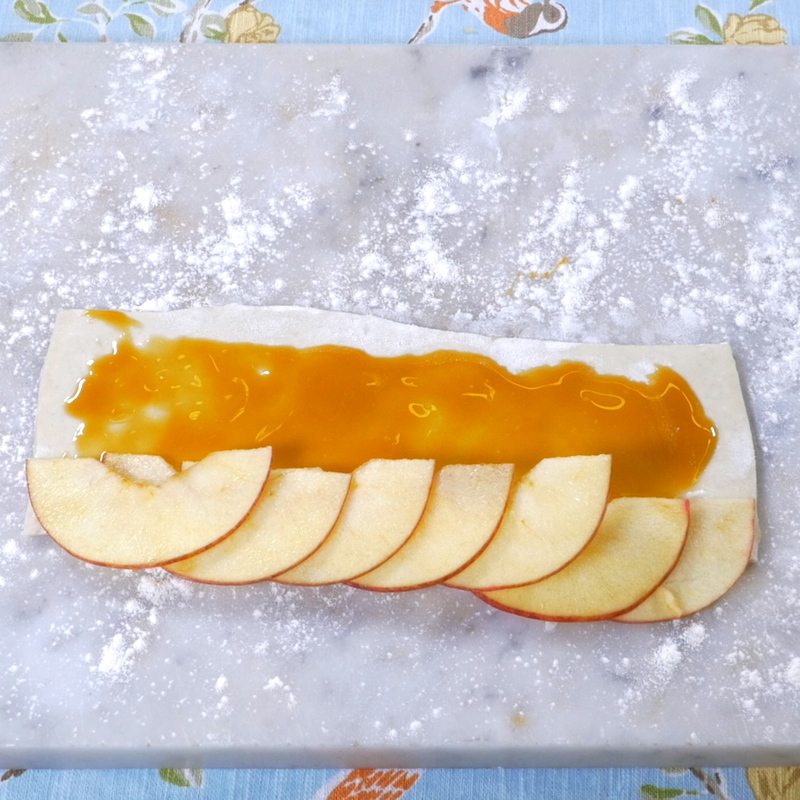 While other versions call for jam of some sort, we decided to make our apples a little more seasonally appropriate and use caramel sauce as the glue that binds everything together. The result is a tasty dessert that tastes as good as it looks, and we can’t wait for you to try it out! Preheat oven to 375º F and lightly grease a standard muffin tin. 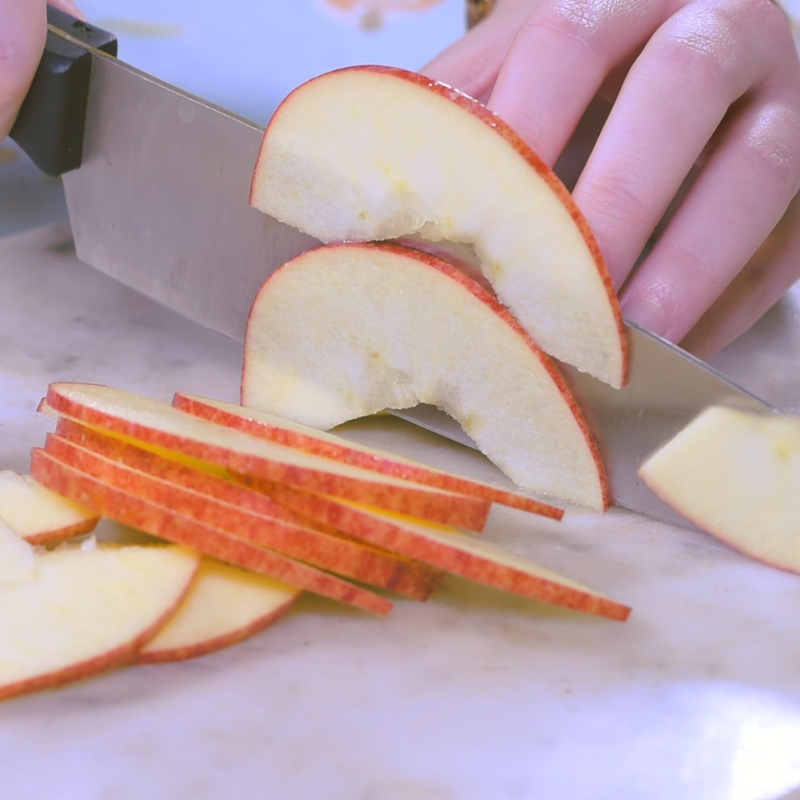 Rinse apples thoroughly, then cut them vertically and remove core. Place halves cut side down and slice them very thinly. Place apple slices in a bowl of water and microwave for 3 minutes, or until softened. 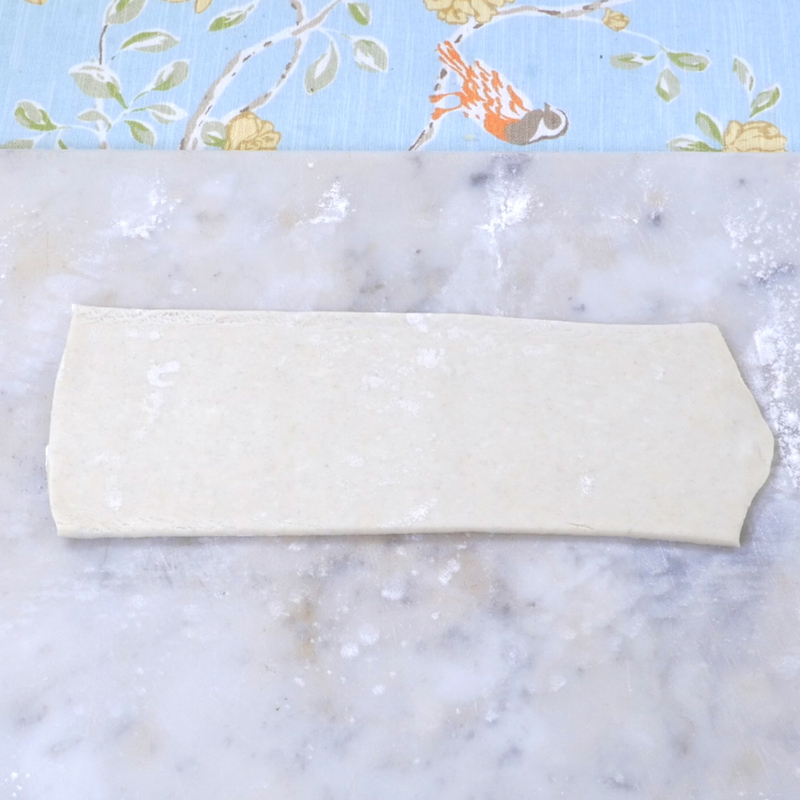 On a lightly floured surface, roll out puff pastry and use a knife or rotary cutter to cut pastry into 3-5 long, narrow strips. 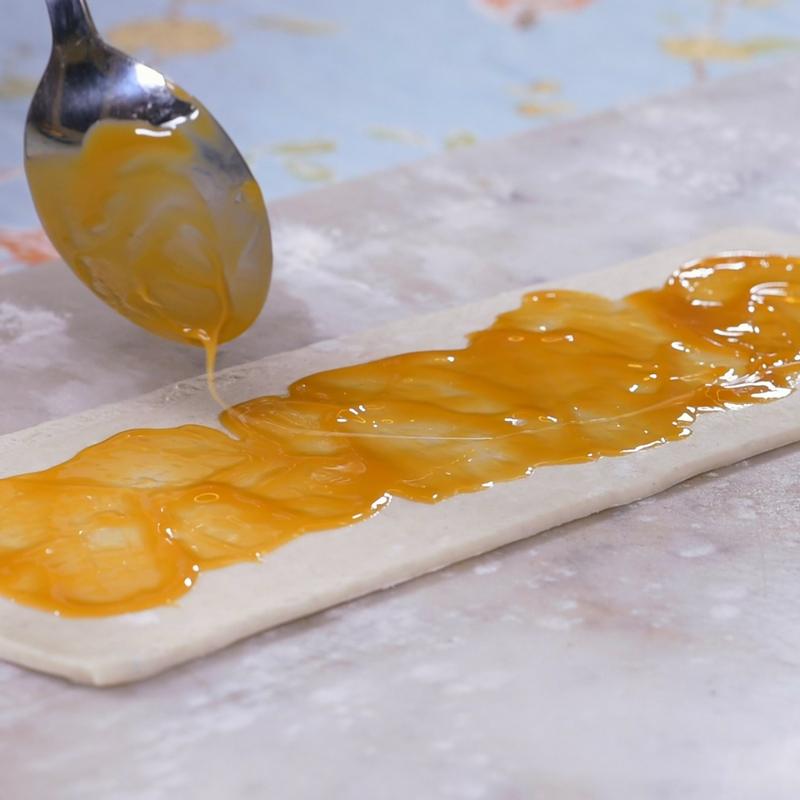 Take one strip and spread 1/2-1 tablespoon caramel sauce down the middle of it. 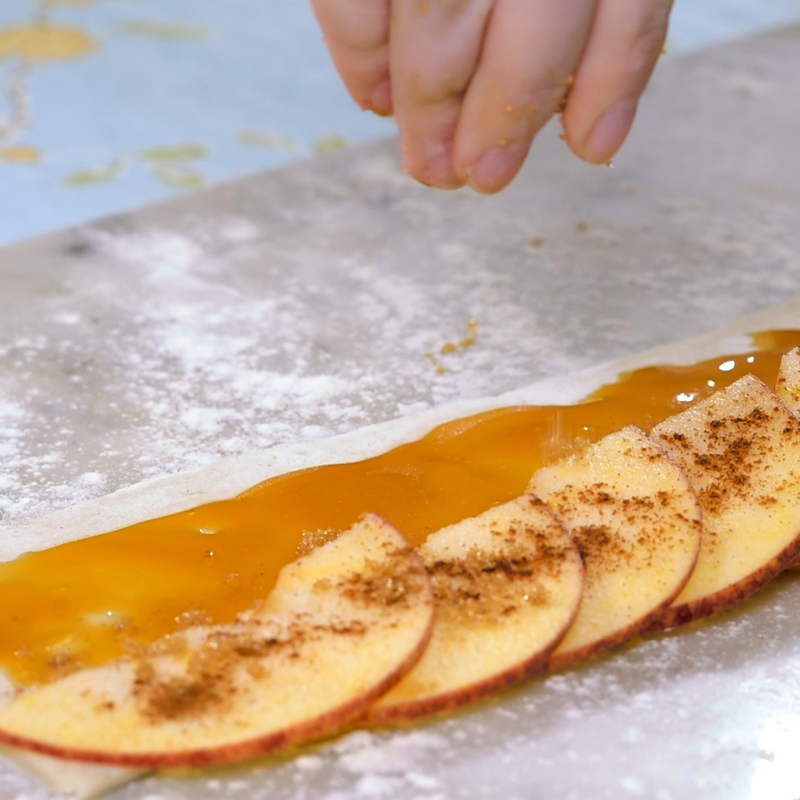 Laying them partially on top of one another, spread apples out at the top of pastry, so that the tops of slices are hanging off the edge of dough. 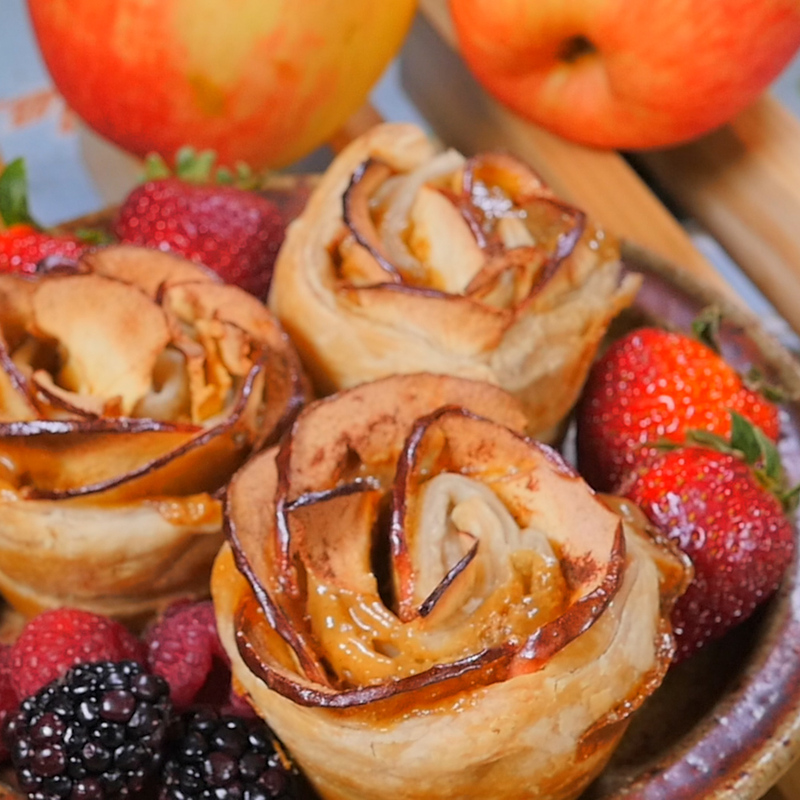 Sprinkle apple slices generously with brown sugar and cinnamon, then gently fold the bottom half of puff pastry up over the apple slices to create a little folder for them. 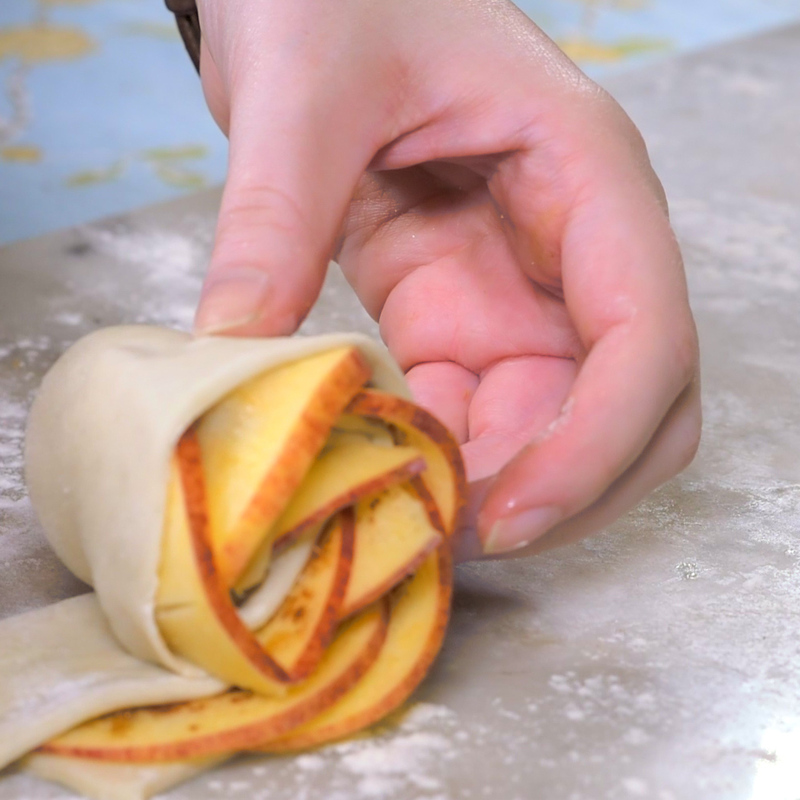 Take the short edge of the dough and slowly roll it over itself until the apples are all wrapped into a spiraled rose. 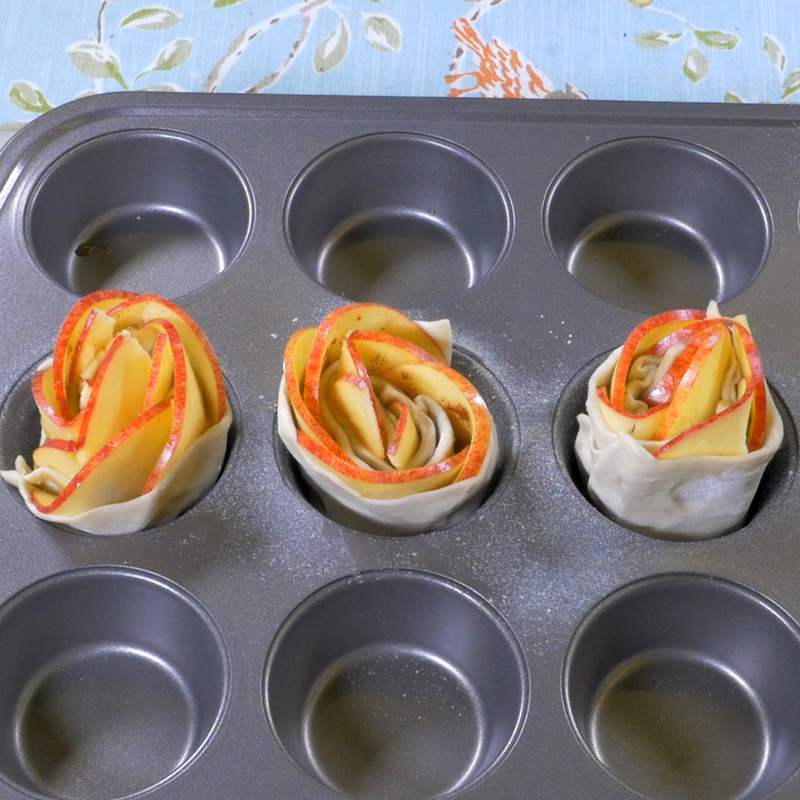 Place apple rose in muffin tin, then repeat with remaining apples and puff pastry. Place muffin tin in oven and bake for 35-40 minutes, or until puff pastry is golden and cooked all the way through. 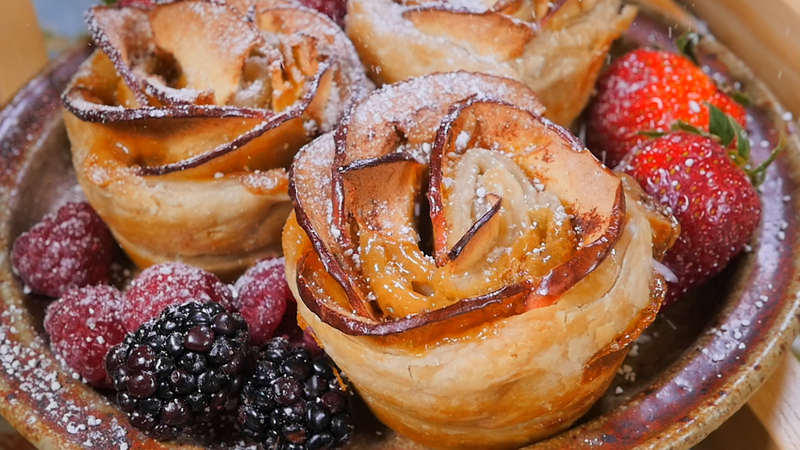 Remove apple roses from oven and garnish with powdered sugar before serving.